When President Osguthorpe first arrived in the mission field, the South Dakota Rapid City Mission was baptizing, on average, something around 20 investigators a month. Overall, that represented around 1 or 2 converts per missionary, per year. President Osguthorpe is reported to have said, “We could do nothing, and still baptize as many people. Something is seriously wrong here.” As I’ve mentioned in a previous post, he concluded that what we lacked was faith. We didn’t believe we could bring more people to Christ. South Dakotans were just too hardened. They just didn’t care about what we had to offer. We didn’t believe the promise made in the scriptures that the field was white, and ready to harvest. We saw the field as dead and trampled, and believed it was time to move on. At about the same time, I believe, President Hinckley challenged mission presidents to double of the number of converts coming into the church. President Osguthorpe took that challenge seriously. He taught. He instructed. He raised our visions. He showed us what could be. He sparked whatever faith was remaining and turned it into a flame. Miracles happened. I remember sitting in zone conference when President Osguthorpe played a recording of a phone call he had made earlier that week. It was a personal conversation between himself and President Hinckley (President Hinckley referred to him as “Russ”), in which he reported that the mission had more than accomplished its goal of doubling the number of converts. President Hinckley’s loving reply was, “That is excellent. Just excellent. Thank you. Now you hold on to them! Hold on to them. Let’s keep them.” During President Osguthorpe’s last month on the mission, I believe every missionary in the mission brought someone into the church. Sometime, a few months after this, Elder Madsen from the Quorum of the Seventy visited our mission. The mission was alive with faith, and we believed that we could succeed. Elder Madsen acknowledged that, and then spoke primarily on two subjects: (1) the Atonement and our ability to repent, and (2) a prophetic vision of the future. Here’s what he said. I’m going to have to paraphrase, and I will likely misquote, since I’m working solely from my notes and from my memory. But the spirit of his remarks, I believe, are intact, and even though these quotes are unsubstantiated, I believe that this prophetic vision of the future of the church is well established in other sources. He said that he was in a recent meeting with President Hinckley, in which President Hinckley remarked that he sees that the day will soon come when the church surpasses 20 million members. Soon after that, he said, it will surpass 50 million. And soon after that, 75 million. The field is ready to harvest, we just need to faith to do it. Elder Madsen extended President Hinckley’s remarks with a prophesy of his own. He talked about how Peter boldly invited the masses to come unto Christ, to believe in His resurrection, and to be baptized in His name. “The same day there were added unto [the church] about three thousand souls.” He said, “Wow, that doesn’t seem to happen very much today. Times sure are different, right? No, not right. That will happen today, if we but have faith.” He cited a verse two chapters later in the book of Acts, when Peter’s testimony converted 5000 men. He cited another, and then another. He turned to the Book of Mormon, and found more. He explained that miracles are not dead. The message of the Book of Mormon is that miracles are just as possible today as in ancient times. All we have to do is believe. We must cease doubting, cease fearing, and simply expect miracles to happen. Elder Madsen said that he sees the day, in the not-too-distant future, when missionaries in the SDRCM will no longer tract or contact people in the streets. Our daily schedules will be so filled with teaching appointments that there will be no time to go out and find people on our own. We properly pray for the safety and success of the full-time missionaries throughout the world. And a common element in many of our prayers is a request that the missionaries will be led to individuals and families who are prepared to receive the message of the Restoration. But ultimately it is my responsibility and your responsibility to find people for the missionaries to teach. Missionaries are full-time teachers; you and I are full-time finders. And you and I as lifelong missionaries should not be praying for the full-time missionaries to do our work! There was the answer: missionaries are to be full-time teachers, just as Elder Madsen prophesied they would be someday. Ordinary members, like you and I, are to do the finding. That is how Elder Madsen’s prophesy will come true (and those who have served missions will likely know that this is the only way it can come true). Because of the experiences I had while I was on my mission, I have been trained to expect miracles. So I look upon this not with skepticism, but with exhilaration and excitement. I’ve studied carefully and prayerfully some who are remarkably faithful and effective witnesses of the Savior and His Church. Their stories are inspiring. One humble man was called as the president of a tiny branch. There were so few members he could not see how the branch could function. He walked into a grove of trees to pray. He asked God what he should do. An answer came. He and the few members began inviting friends to join with them. In a year, hundreds had come into the waters of baptism and become fellow citizens in the Lord’s Church. I know a man who travels almost every week in his work. On any day there are missionaries somewhere in the world teaching someone he met. There is another man who seems undeterred by how many he must speak to before any of them wish to be taught by the missionaries. He doesn’t count the cost in his effort but only the happiness of those whose lives are changed. There is no single pattern in what they do. There is no common technique. Some always carry a Book of Mormon to give away. Others set a date to find someone for the missionaries to teach. Another has found questions which draw out feelings about what matters most in life to a person. Each has prayed to know what to do. They each seem to get a different answer, suited especially to them and to the people they meet. Let me repeat what President Eyring said: there is no single pattern in what they do. However, I suspect there is at least one pattern: none of them do nothing. They all do something. Too often, as I hear members speak about the importance of missionary work, I only hear stories from their mission (often some 40 years previous). This is often because they haven’t had any real, shareable missionary experiences since then. My personal goal is to never use a personal missionary story in a Gospel setting (successful or unsuccessful) that is more than 3 months old. Is this goal difficult? I actually don’t think it is at all. With fasting, prayer, and the Spirit, I believe it is not only possible, but plausible. And it is all really just a matter of being willing to invite. Elder Eyring explained, “When we bear testimony of truth to [others], we must convey to them the choices which, once they know that truth, they must make. There are two important examples: inviting someone to read the Book of Mormon and inviting someone to agree to be taught by the missionaries.” In my mind, inviting someone to come to church, or inviting them to read the Book of Mormon, or sharing my understanding of the Restored Gospel is not something we wait to do until prompted by the Spirit. It’s something we instinctively do unless prompted by the Spirit to wait. And if we are praying daily for spiritual guidance and are acting out of love, I believe that the Lord will provide the direction we need. To be part of [this] miracle, you must not wait until you feel closer to Heavenly Father or until you are sure that you have been purified through the Atonement of Jesus Christ. Pray for the chance to encounter people who sense there could be something better in their lives. Pray to know what you should do to help them. Your prayers will be answered. You will meet people prepared by the Lord. You will find yourself feeling and saying things beyond your past experience. Good stuff. I agree with the things taught here. Perhaps sometime I’ll blog on the experience on my mission with Elder Gene R. Cook and conversions. It really was a miracle we saw. I loved President Hinckley’s fireside in which he spoke twice and spoke of doubling the number of converts. I was a bishop at the time (and feeling the full weight of the new (at the time) emphasis of bishop’s responsibilities for missionary work. 1. Unlike missionaries, many members feel like they encounter the same relatively few people all the time. Often they feel like they have invited once, and cannot continue to invite without appearing a pest. So each member may feel that his potential pool of invitees is small. 2. Because of the small pool, members feel nervous about offending their friends, or seek to invite those they feel are most “ready”. Elder Clayton Christensen (among others) taught that we ought not to judge people’s readiness, but rather invite as many as we can. 3. Some will say that we cannot control the outcome (baptism) because that is the other person’s choice. It’s true the potential member must choose to be baptized, and we cannot force that. But I don’t believe Elder Bednar or Elder Eyring’s promises suggest that we will control the outcome (or that the Lord will). Instead I read those promises to mean that the Lord knows the end from the beginning, and we just need to align ourselves with God’s will so that the endgame can play itself out. 4. Some members are reluctant to share because they believe they are not good examples or good members. They may feel that wayward children or other issues prevent them from being good missionaries. Interestingly, I found on my mission that some of the best member missionaries were members who were closer to less active than active; their friends were not looking for perfection but comfort, which ultimately is what the Holy Ghost will bring. Thanks for your comment. I appreciate that you pointed out these hurdles not as excuses, but as real psychological struggles we’ve got to set aside if we are going to be instruments in God’s hands. ldsphil, here’s a philosophical question for you. If this vision of members doing all of the finding and missionaries doing all of the teaching were a reality why would we need full time missionaries? We have stakes full of members with much more life experience and knowledge than 19 year old teenagers who could easily teach the gospel and stakes full of priesthood holders who could baptize them. Why do we need full time missionaries at all in this vision of missionary work? KLC, I don’t fully know the answer to that question. I have some suspicions, but that’s all. I suspect it has more to do with the personal consecration of two years of one’s life to full-time labor on behalf of the church. That is for the benefit of the missionary more than anyone. All I know is what Elder Bednar has said, and that is that we should be doing the finding, so that missionaries can do the teaching. And, statistically, member-referred investigators are many, many times more likely to join the church and remain active than investigators found through the efforts of missionaries. In the Kimball days, the answer to that question was that stake missionaries would do everything, freeing full-time missionaries to preach behind the Iron Curtain. So many of the points above directly echo President Kimball. He, in turn, asked why we weren’t fufilling President McKay’s idea “Every Member a Missionary.” I don’t know if the idea goes back farther than that. It seems to belong to a time when most stakes are established in places with minority Mormon populations. Something I realized was exactly what has been said already; there is no One True Method for missionary work. Some people can be invited by 19 year old boys wearing suits, some by their neighbor. So full time missionaries would not be superfluous even were they to primarily teach. My brother served a mission with very little tracting—in Salt Lake City. So some of us must be doing it right. Personally, I think part of the reason we send out 19 year old boys is so they can grow up and learn how to really work. I saw that change in my brothers (who were not slackers in the least). They were men when they came home. My own experiences as a full time missionary, although vastly different than those of the South Dakota mission, were also life changing as well. Missionary service really can and does form you into a better person. We learn by modeling the example of others, Geoff. =) Can you imagine how quickly our faith in member-missionary work would grow if, when talking about missionary work in Sacrament, Sunday School, and Priesthood meetings, we mostly heard stories like yours (instead of primarily stories of missions long ago and far away)? Thanks for your story. A suggestion to anybody reading this: take the first step and order a bunch of English and Spanish-language Books of Mormon (I say Spanish because most readers of M* are in the US where we have many Spanish speakers). Set a goal of handing out one book in September. See how it goes. If you miss a month, don’t despair. Hand out another one in December. Take a Book of Mormon and put it in your car. You would be absolutely amazed at the response. I usually say, “I would like to give you a gift, would you accept it?” Everybody says yes. Highlight Moroni 10:3-5 and also 3 Nephi 11. I usually write my personal testimony on the first page. I’m telling you, this is one of the best ways to feel the Spirit of the Lord. Another option is to create yourself a profile on Mormon.org. Then order a bunch of the new Mormon.org pass along cards. Put your URL to your profile in it. Then pass those along. Cheaper than BoMs, and you have the opportunity of them giving more feedback than a BoM you may never see again. Faith is not the same thing as optimism, an expectation that things will work out in the short to medium term, self-confidence, or any of that. 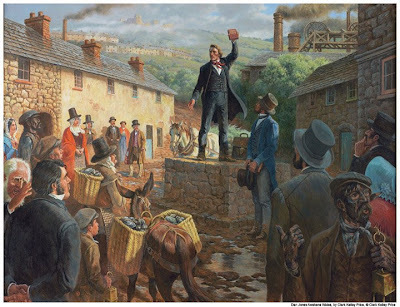 We cannot conclude that Zion’s Camp will succeed in liberating Missouri, that God will preserve the Saints in polygamy, that Moroni will convert his people, that Christ can jump off temple and be caught by angels, if only there were more faith. Not to detract from your main point, which is quite good. I served in Chile a few years before the huge surge in baptisms but we still regularly taught 20-25 discussions a week and saw many people baptized. My friend served in Quebec. He never gave the last 2 discussions in his whole mission, let alone baptize someone. Now I know why we had such different mission experiences. I had lots of faith, I believed I could succeed, my friend apparently had little or no faith. Thanks for explaining this. KLC, you know that is not what I’m saying. And it’s your choice to read this as an accusation, when it isn’t meant to be. That said, you and I both know, because the scriptures are quite clear about this, that when miracles happen, they are the result of faith. And we know that those who exercise faith do see miracles. Does that mean that those with faith can make things happen the way they want? No—it just means they can be instruments in God’s hand in making things happen the way HE wants. And God has promised us, through His spokesmen, that if we exercise faith and act, we will see miracles happen in regards to missionary work. ldsphil, I’m sorry that was a little snarky but I think it is well deserved. Don’t you think my friend and most every other missionary in Quebec exercised faith during their missions? Don’t you think that my friend and most every other missionary in Quebec acted on that faith by going out and working hard every single day? Where was their miracle? I don’t think you’re making accusations, I think you’re being incredibly simplistic about faith and baptisms and the connection between them. KLC, why would we assume that equal faith applied in different circumstances would yield equal results? Perhaps the miracle in a low-baptizing mission (mine was in Europe) was that we had ONE baptism in three years in a small branch, while the miracle in Latin America was very different. Both can be miracles. Both can (in part) be because of the faith of the actors involved. But they do not need to be the same. Your point is not lost on me, KLC. I served in a very tough mission. I worked hard. I was obedient. I think as missionaries go, I, and those who served with me, were pretty good. And yet we did not reach every baptismal goal. We did not have as many converts as we liked (and we never sought to have Latin-America-level baptisms). But from time to time I did have spiritual evidence that my offering was enough, that the Lord was doing His work through my fellow missionaries and me. In the end, I think the promises made recently talk about our need as members to exercise enough faith to invite others. If the Lord has prepared people (as the scriptures and our leaders suggest), then presumably if we invite enough people, we’ll turn up some of those who are being prepared. But Elder Eyring’s promise is not that those we invite will be baptized. It’s that “[we] will meet people prepared by the Lord. [We] will find [ourselves] feeling and saying things beyond your past experience.” I’ll be even missionaries in cold Quebec have had that experience. KLC, I’m not in a position to speak to the situation of the missionaries in Quebec. I wasn’t there, I didn’t experience it, and I don’t know what their situation was. All I can say is that the reason we in the SDRCM weren’t succeeding is because we lacked faith. And I can testify from personal experience that when we collectively exercised faith, we saw miracles happen. And I can also say that we’ve been promised, in General Conference, that if we individually exercise faith and act, we too will see miracles in our own missionary efforts. If you want to tell me that I’m wrong, and that the miracles we witnessed in the SDRCM weren’t the result of faith, go ahead. If you want to tell me that Elder Bednar and President Eyring’s promises are wrong, go ahead. But I think you’re fighting the wrong battle. I’ll make a bold, hard claim. Sometimes, not experiencing success is a result of a lack of faith. Just now, I didn’t say always, I said sometimes. I can’t judge when and who that applies to. It may not be the case in Quebec. It may not be the case in Russia. All I can say is that I know from personal experience, that it was true for missionaries in the SDRCM. I witnessed it. I even heard people say, “I don’t think it’s even possible to bring more people into the church into this area.” And once that lack of faith was corrected, things changed. Moroni says, “Behold, it was the faith of Nephi and Lehi that wrought the change upon the Lamanites, that they were baptized with fire and with the Holy Ghost.” This implies that had they not had faith, things would have been different. Faith does sometimes matter, and to say it doesn’t is, quite frankly, not true. It seems to me that one of the principle messages of the Book of Mormon is from Mosiah onwards is one of faith. Abinadi exercised faith, and saw no one converted. But his faith led to the conversion of Alma, which led to the conversion of his son Alma and his friends, including Ammon, which led to the conversion of thousands upon thousands of Lamanites, which led both to outright war between nations and to the saving of the Nephite nation via the strippling warriors, which in term eventually led to the conversion of the entire Lamanite nation. Abinadi’s faith, although he saw no results personally, eventually dominoed into the conversion of the entire nation. And that was all within two generations. Faith does work miracles. And I therefore think that there is nothing wrong in saying that if we collectively and individual exercise faith, we too will see miracles. The promise is written in the scriptures in dozens of places. And since I personally feel that it has been prophesied that one of those miracles is that the church will begin to grow exponentially, I see nothing wrong in claiming that such a result is connected to our collective faith and collective action. Those who served hard missions don’t need to feel accused by this in any way. Ammon’s friends didn’t see success at first, and I’m sure they had faith. But that didn’t stop Moroni from saying, quite explicitly, that “it was the faith of Ammon and his brethren which wrought so great a miracle among the Lamanites.” Just because there exist trials of faith, and just because sometimes the miracles are (as in Abinadi’s case) bequeathed to the next generation, doesn’t mean that there is no connection between missionary success and faith. And that doesn’t mean that the success of the SDRCM wasn’t a product of faith. Nor does it mean that aren’t other places and other missions who will see more success as they exercise more faith (but since I don’t know where those places are, or if they exist, I haven’t talked about them—I’ve simply talked about the promises made to you and I, now, today). It really is all about desire. If you really, really want to bring people to the gospel, you’ll find a way. That desire will grow into a powerful faith, and success will come. I think many people who don’t succeed at missionary work (like me), could probably all find the reasons in their heart. They don’t really believe they can do it, or that anyone will be interested, and it becomes a self-fulfilling prophesy. Reverse that belief, stoke that desire, and miracles will happen. What you really want, you pray for, with great faith, and God will give it to you. For me, I just don’t know how to increase that desire, because honestly, I don’t want to share the gospel. What I want is to connect with people, love people, discern their hearts, learn from them, and give to them whatever the Holy Spirit might prompt me to share. If the Spirit prompts me to give them a Book of Mormon, great, if not, I don’t care to give one. I’m open about being a Mormon, extremely open, but I have no desire for them to become Mormon, unless they somehow hear the voice of God tell them, “Come follow me.” I know this is bad because Jesus commanded us to go and baptize every nation. So, I have the feeling someday I need to repent, and go out and share. But I am loathe to do it now. But it’s good to get reminders that this truly is an extremely important part of our faith, one that we can’t ignore. Having had several friends serve in Quebec maybe their miracle is seeing a Temple come there, maybe their miracle is being converted themselves. Another fact is one of the greatest CES guys in Canada is there now teaching the Gospel to the young folks in their own french language and maybe their retention is higher then some other areas in Canada-it is at least for where I live in Canada! I appreciate the spin that Paul and Whizzbang put on my question about where is the miracle for those who work hard and don’t see baptisms. I believe in those kind of miracles. But that spin has nothing to do with ldsphil’s post. He explicitly defined more faith as leading to baptisms. Would his MP have proudly played back a phone call to the prophet if he tried to tell him that they had one more baptism than they had before or that his missionaries had converted themselves or that they had received a spiritual confirmation from the Lord that their offerings were enough? The problem is that in modern missionary work the only coin that gets recognized is baptisms. KLC-I agree with you that baptisms seems to be one of the indicators for “success” but maybe the Lord sees other things to like what has been indicated previously. Where I live in Canada we have the worst retention in the area but we have great members here and we are in the process of getting a Temple so I dunno! I served my mission where it was a numbers game pure and simple and baptisms were it and the more you had the more righteous and better you were perceived to be but looking back the real miracles I see from that experience were most of the missionaries are still active, which is amazing, and one of the counselors in the Mission Presidency is now a General Authority and another miracle is that the face of missionary wrok has changed with the implementation of Preach my Gospel and other new ways of finding and teaching the people. KLC, the only other thought I’d have is that if the prophet has promised increasd baptisms, and a mission president really has that confirmation that they’ll come in his mission, then encouraging increased faith in those promises doesn’t seem off the mark. I’m not a fan of the sales-convention-let’s-all-go-out-there-and-succeed boosterism that masquerades as faith, but there is a place for increased faith in our lives, even when we can’t see the outcome clearly. I’m with Paul. I think one of the keys in this case—one that ldsphilosopher does not ignore—is that in this case the SD mission had been given a specific promise by their priesthood leader. We, too, have been given a promise as members. And in order to open the door for the fulfillment of those promises, we must have faith. At the risk of putting words on the OP’s mouth, I think perhaps his point is partially that we are not, as members, generally living up to those promises. This does not need to lead to fear that we are not worthy, nor guilt that we are not worthy. Focus on our own worthiness, good or not, can be set aside. The perfect love of Christ can cast out our fear of our own unworthiness and allow us to focus on the service of others. When we truly believe that the gospel is a blessing, and we truly love our brothers and sisters, how could we not long to share it? KLC, I do believe that as our faith grows collectively, the church will see more converts. Does this mean that if you exercise more faith, you will see more converts? I have no idea. Here’s a parallel example: the Book of Mormon directly correlates righteousness with prosperity. But does that mean anyone who is struggling financially or otherwise isn’t righteous? No—the promises are made in the aggregate, not the particular or the individual. So, while I believe that church growth hinges on the collective faith of its members, and our willingness to act in faith on the instructions of our leaders in sharing the Gospel, I make no claims that one can use the number of baptisms they see as an indicator of their faith. 1980, two missions in Bolivia. In my mission, we had renewed our faith and effort, as well as being more efficient and effective by working through members. In Feb 1980, we had 56 baptism. Elder Gene R. Cook had asked us to have a Miracle March, and we had 188 baptisms. By December, we were baptizing around 300 per month. Meanwhile, the other mission was continually struggling. The mission president went through the mission and had to send about 20 missionaries home. I had a chance to visit with some of their missionaries during our mission, and shared with them about our success and how we were doing it. They did not believe it could happen in their mission. How did I meet those missionaries? They took a few days off from their mission and came down to visit a city in our mission where I was staying. It concerned us when they stepped into one of the fountains in a park, to play in the water. While I’m not thinking most missionaries are like that, I can see how a lack of faith, a lack of effort, and inefficiency can all add up to low conversion rates. For my last area, I was sent to a small town on the Argentine border. There had not been a baptism in a year. I promised the mission president we would baptize monthly. For the six months I was there, we did just that, with the number increasing every month. I left in Dec 1980, when they had 20 baptisms. The next month, the 4 elders had another 20 baptisms. We started working through the members. I was asked by my mission president to tract one hour per day to get the people along the way. We averaged 30-40 discussions per week. My high was 70 discussions in a week, and we worked until midnight every night that week. And it wasn’t just me. This vision, faith and energy went throughout the entire mission, and the members caught on to it, as well. I think the interplay between KLC and LDSP are illustrating a very general personality problem in the Church. Someone shares their experience (dramatically improving their baptismal numbers because they had more faith), and someone else interprets it as “I must be lacking faith because I haven’t led to enough baptisms.” Such thinking is only possible because we as members accept (at times) emotionally abusive teachings. For anyone to claim that they KNOW why certain things are happening, is really a highly arrogant claim. Any church leader will get to explain to God whether or not what they said was truly inspired by the Spirit or not, and therefore I have no need to judge them, but I recognize that humans often make mistakes. We have no promise of infallibility from our leaders. Period. It’s indicative of our cultural prevalence to attack instead of encourage, to do instead of be. If members could nurture and love and encourage one another instead of telling them they don’t have enough faith… Some of this thinking reminds me of people who would come up to my wife’s sister and tell her if she had enough she’d be healed of her cancer. Luckily, I know that I don’t, and more importantly, no one else on this planet knows why things turn out the way they do. OTOH, I do believe that positive thinking is important, but it’s more than just “telling others to have more faith.” It’s also recognizing that this isn’t our plan, it’s His, and He hasn’t given us all of the game plans. We try, and that’s part of our progression. I have not accused anyone of a lack of faith, nor have I made accusations of any kind. I’ve only explained what I’ve experienced in my own mission in my own life, and then reiterated the promises that apostles have made to individual members like you and I.
I never, ever said that any person or mission’s lack of baptism is a result of a lack of faith. All I said was that the SDRCM’s lack of baptisms at that time was due to a lack of faith. If others want to generalize, that’s their choice, but that’s not what I’m doing. There’s no need for anyone else to feel accused, unless they somehow feel insecure about their own faith. If you think President Osguthorpe’s approach was emotionally abusive, well, you are very, very, very wrong. He had every stewardship to make the claims he did, and he turned out to be right. Prophets since the beginning of time have chided God’s children for a lack of faith. Were they emotionally abusive too? I reject the idea that we can’t cry repentance and make promises without being emotionally abusive. But I will reiterate that I believe strongly that if the church collectively exercises more faith, we will collectively see more converts. But that can’t be applied to an individual level—only a collective level. ldsphil, isn’t your whole OP based on a generalization of your experience in your mission? Why did you write it as a call to action instead of a remembrance if it isn’t a generalization? I’m sure you didn’t mean to accuse anyone but your analysis can and has and will be used by members and leaders as an accusation of limited faith. By the way it’s a wonderfully arrogant statement to proclaim that the only ones who feel accused are those who feel insecure in their faith. KLC— why are you upset? Psychochemiker? I’m genuinely wanting to know. I just don’t see the judgmentalism you are attributing to the OP. It seems that perhaps you are getting upset at things that aren’t actually being said. Are you saying that priesthood leaders should not urge their people to greater acts of faith when prompted? Are you saying that if the members engaged more fully in genuine missionary work that more people would not respond? Or are you saying that ldsphilosopher shouldn’t highlight the promises which have been made to the membership as a whole because it is possible that they will not be fulfilled? I am at a bit of a loss as to why there is so much vitriol. SilverRain, I don’t see any vitriol. If you noticed I’ve said more than once that I don’t believe the OP or the author had any intent to accuse. I’m hardly any more upset than you, I’ve asked some questions like you have, is that the definition of being upset? But the fact is the OP is an accusation in general terms. Faith equals baptisms which equals success. I don’t believe that. I don’t believe that god is a vending machine that spits out predetermined blessings, in this case baptisms, when we feed in the correct coins of believing and faith. It doesn’t work that way. Again, I have no problem with the OP being a remembrance of a specific instance where a specific mission was given specific revelation that they acted on and were blessed. But I don’t read the OP as a remembrance, I read it as a call to action. And even though ldsphil believes that his MP invented this kind of thought it runs rampant through post WWII missionary work in the church. And even though I believe him when he says that he intended no accusations, the fact is that this kind of thinking regularly is used to accuse and thus hope to motivate members and missionaries. KLC, if you knew me at all, you’d know that I also don’t see God as a vending machine. Check out my “Yellow Brick Road Syndrome” post if you don’t believe me. More faith church-wide will lead to more baptisms church-wide. So yes, in that sense, I am generalizing my mission experience. But I’m not alone in that. I feel like prophets and apostles have been making that promise for decades. And that does not, I repeat, that does not mean that YOU will see more baptisms. I cannot make any knowledge about what God has in store for you or your mission, except that I know that miracles will happen (of some kind). And yes, my post is a call to action. I am unapologetic about that. You, me, all of us need to do better at being missionaries. We ALL do… even the best of us. And I promise that if we do, we will see miracles happen. God has made that promise through His spokesmen, and I will boldly repeat it. We teach and live the gospel of repentance, not the gospel of self-esteem. ldsphil, ideas have consequences. The idea that all we need to do is have more faith and then baptisms will increase is magical thinking and it does indeed reduce god to a vending machine, whether you intend that or not is really irrelevant. It is hubris for us mortals to believe that we know why god blesses us, to pinpoint exactly the quid pro quo that generates blessings in our lives. KLC, it does not reduce God to a vending machine. It simply assumes that God keeps His promises. And God does sometimes reveal the reasons He blesses us, and He does sometimes reveal the prerequisites for those blessings. Your quarrel right now is with the prophets, not with me. If I follow your logic, you are saying that we should never promise people blessings for obeying God’s laws… even blessings the prophets themselves have said would result from obedience. As a missionary, I promised people that if they read and pray about the Book of Mormon, God would reveal to them whether or not it was true. Did it happen every single time? No… but it’s a promise that I still make, because it’s a promise encoded in the scriptures themselves. Does that make God a vending machine? I don’t think so. Also, I want to followup again with Psychochemiker: Priesthood leaders have every prerogative to inform those under their stewardship that they need to exercise more faith, as they are prompted to do so by the Spirit. Prophets, apostles, and priesthood leaders have been doing that for thousands of years. Doing so lovingly and as prompted by the Spirit is not manipulative or abusive. And yes, they can read your mind, if the Spirit reveals your thoughts to them. Amulek read knew the thoughts of Zeezoram’s heart, as the Spirit revealed them to him. Now, this doesn’t mean that every time a leader claims to know what you are thinking, or claims to know the level of your faith, that he is right. Many, if not all, of us will sometimes encounter people who exercise unrighteous dominion. All I’m saying is that telling those under one’s stewardship that they need more faith can be perfectly appropriate, if done lovingly and as prompted by the Spirit. President Hinckley has also made promises regarding the exponential growth of the church. He challenged the church to double the number of convert baptism, and said that the only way this can happen is if members exercise the faith to begin shouldering the responsibility for missionary work themselves. Elder Oaks also made that claim, as has Elder Bednar and Elder Eyring. If we as members begin to shoulder this responsibility, and act in faith (for missionary work is an act of faith), we will see the number of convert baptisms grow in remarkable ways. Amen. I’m glad I read the comments, because this is exactly what I wanted to say. Faith is also not zeal. Faith is hope in things yet unseen which are true. Therefore the more true things a person can apprehend, the greater their faith can be. I remember somewhere in Paul his acknowledging that the Jews of his day had great ‘zeal towards God’, but ‘not according to knowledge.’ Increasing faith is not primarily a matter of increasing intensity of belief, but rather accuracy and range of belief. Faith can be seen in action, but not all action derives from true faith. Action deriving from intensity of belief is not the same thing as action deriving from faith. And not all action is good action, even when it is directed towards a desirable end. Clearly, an increase of faith would result in more missionary work. It seems to me that faith must come from individual members living the gospel. Living the gospel increases faith in living the gospel. It tends to focus more of your concern on other people’s well being – especially as it relates to what is real and deep and what is illusory or temporary. ‘Teaching the gospel’ then becomes merely a matter of acting and talking about our lives, including things that run deep with us, in language that is natural to us. The last thing we should do is pretend to be someone other than what we are, because we are temporarily stirred up emotionally. And, as a corollary, I certainly see nothing of “if you don’t see the blessings, it is because you lack faith.” Undoubtedly, some people exercise unrighteous dominion, twisting God’s promises. Doubtlessly, there are times when the blessings of the Lord don’t come in the way we expected or hoped (and I trust I am qualified to understand that thoroughly, bearing in mind my past,) BUT that doesn’t mean that when we have been given specific admonitions from our leadership, we should allow fear or guilt to keep us from moving forward in faith. And it certainly doesn’t mean our leadership is inappropriate to speak these promises, nor the OP for highligting them. You are throwing the baby out with the bathwater. And I agree with LDS-P. Many 19 year old boys do not have the understanding to have a high degree of obedience and faith to perform miracles. Not only did I experience this on my mission, but also in the 9 years I served as Ward mission leader and/or Stake mission presidency. While the missionary’s personal worthiness and faith are not the only factors on conversion success, they are the only ones that the missionaries have control over. And they make a huge difference in whether an area baptizes or not. I’ve seen disobedient missionaries give the Church in an area such a bad name that members would not give referrals, and non-members would not give them the time of day. I knew a stake president with some referrals in his wallet that remained there for months, while he waited for quality missionaries to give them to. And I’ve known missionaries that could walk into the chapel and have referrals thrown at them by one member after another. What LDS-P states is basically true. A good portion of my mission was in an area that was quite damaged by previous missionaries’ service. Though greater faith doesn’t equal baptisms, I think part of the point is that the Lord has promised through His servants that if we increase our faith, He will bless more people to come to a knowledge of the gospel. Confidence and faith are not the same. There is a difference between believing that baptisms are a function of faith, and believing that the Lord will make good His promises.